I’m not sure what attracted me to this book. I was never the little girl who dreamed of her wedding and getting married one day and as an adult it’s never been remotely on the cards. But it is funny how little girls still talk about getting married. I saw my cousins 4-year-old at the weekend and she told me all about who she was marrying, their wedding and what they had worked out for their life. But in the interest of playing along I did have a think while reading this book of what my wedding would look like. I met someone a while ago that I could see myself living very happily with so I imagined him waiting for me at the altar. Then I promptly thought, sod it, no big meringue dress and formal stuffiness for me. I would just want all my family and friends to be in one place and have a big party. I definitely can’t see myself going all Bridezilla. It would be nice to have a pretty dress though, just not one that required extra wide doorways and a lifetime mortgage! The book was written in a way I hadn’t seen before. It is in part diary entries and therefore the layout is similar to a script that people might read out. It took a while to get used to but in actual fact I think it worked quite well. It makes your head spin all of the things they try to organise and all the unnecessary items you pick in the heat of the moment. We recently threw a 40th Wedding Anniversary party for our parents and I can attest to the lists of things we had to have getting longer and longer and in the end half of it never saw the light of day! What was interesting was at the end of the book the author added tips that she wished someone had told her when planning her wedding. 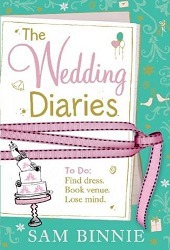 I guess if you were going to be planning a wedding then it might help to read a book like this. I’ve seen people get so caught up in organising things that it becomes the only thing they can think or talk about to the detriment at times of actual life. This book helps you to remember that in some way.